Bank jobs in 2018 is a golden opportunity for bank aspirants as various public sector banks recruit eligible candidates for the posts of Probationary officers, specialist officers and clerks/Assistants every year to fill large number of vacancies in their branches located all over India. We have listed all the Upcoming bank jobs 2018 in exhaustive manner to help the bank aspirants. 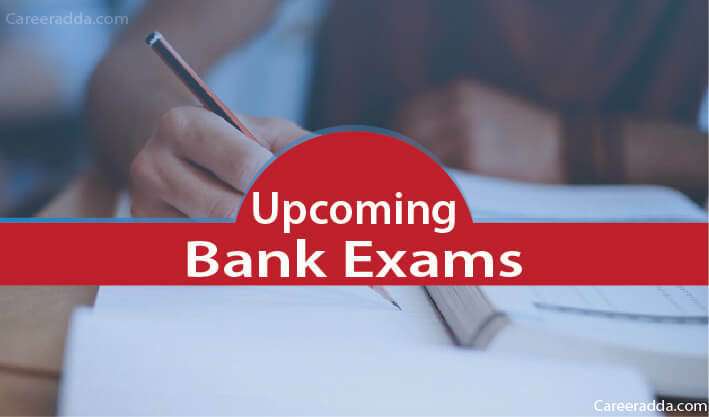 Most of the aspirants out there will be waiting for notification of various banks to appear in the bank exams for the posts of PO, SO, clerk, assistant etc. For the year 2018, nearly 45,000 vacancies will be filled by various banks. Almost 45,000 vacancies are available in various banks all over the India. The multitude of job posts that are waiting to be filled is that of clerks, assistants, probationary officers, and specialist officers. The State Bank of India, Reserve Bank of India, IBPS and other private banks organize recruitment events on a yearly basis to fulfill the requirement of manpower in their banks. Some of the upcoming bank recruitment events you need to check out in the year 2018 are SBI Recruitment 2018, for PO, SO and Clerk, IBPS Recruitment 2018 for PO, Clerk, SO, and RRB PO, clerk, SO and RBI Grade B officer & Assistant along with many other posts by various banks like NABARD, canara, syndicate bank etc. Essential Qualification: An applicant should have a graduation degree in any discipline with at least 60% marks. Application Fees: Rs. 100/- (for SC/ST/PWD candidates) and Rs. 600/- for others. Important Dates: Notification will be out in August 2018. Further dates will be cleared after release of official notification. Selection Procedure: Selection will be done on the basis of final marks obtained after qualifying objective test, descriptive test and interview. Important Dates: Notification will be out in October 2018. Further dates will be cleared after release of official notification. Selection Procedure: Selection will be done on the basis of final marks obtained after qualifying preliminary examination, main examination and interview. Essential Qualification: An applicant should have a graduation degree from a recognized University or its equivalent with proficiency in local language. Important Dates: Notification will be released very shortly. Selection Procedure: Selection will be done on the basis of final marks obtained after qualifying preliminary and main examination. Number of Vacancies: Will be notified soon. Essential Qualification: An applicant should have a graduation degree in relevant trade/field. Important Dates: Notification will be out very shortly. Selection Procedure: Selection will be done on the basis of final marks obtained in an online test. Essential Qualification: An applicant should have a graduation degree in any discipline from a recognized university. Application Fees: ₹100/- (for SC/ST/PWD candidates) and ₹600/- for others. Important Dates: Online application process is over now. Preliminary examination is going to be held on 29th & 30th Apr and 6th & 7th May’18 and result will be declared on 17th May 2018. Main examination will be on 4th June 2018 and final result will be declared on 5th Aug 2018. Selection Procedure: Selection of candidates will be done on the basis of final marks obtained after qualifying Stage I, II and III examinations. Essential Qualification: An applicant should have a degree in respected field along with working experience. Application Fees: ₹100/- (for SC/ST/PWD candidates) and ₹600/- for general and OBC candidates. Important Dates: Online application process is over now. Date for interview will be posted here very shortly. Selection Procedure: Final selection of candidates will be based on short listing and one or more rounds of PI (Personal Interview). Name of the post: Officers in Grade B in General, DEPR & DSIM. Application Fees: Rs. 100/- for SC/ST/PWD candidates (intimation charges only) and Rs. 850/- for OBC/General candidates (Application fee including intimation Charges). Important Dates: Will be updated very shortly. Selection Procedure: Selection will be done through national level online test in two phases i.e. Phase I & II. Name of the post: Assistant Manager in Grade ‘A’. Essential Qualification: Graduation in a particular discipline. To know post-wise essential qualification. Application Fees: Rs. 150/- for SC/ST/PWD candidates (intimation charges only) and Rs. 800/- for all other candidates (Application fee including intimation Charges). No application or intimation charges for staff. Important Dates: Website link for online registration and fee submission is already activated and remain opened up to 2nd April 2018. Applicants can download Phase I (preliminary exam) admit cards from 27th April 2018 onwards. Phase I online examination will be held on 12th May 2018. Phase II (main examination) will be held on 6th June 2018. Selection Procedure: Selection will be done through online tests in two phases i.e. Phase I & II followed by an Interview. Essential Qualification: An applicant should have a graduation degree in any discipline with at least 60% marks (for SC/ST/PwD- 55%). Important Dates: Online application process is over now. Admit cards will be available from 05.02.2018 and paper will be held on 18th Feb 2018. Selection Procedure: Selection of candidates will be done on the basis of final marks obtained in an online objective test and descriptive test. Application Fees: ₹118/- for SC/ST/PWD candidates and ₹708/- for others. Important Dates: Online application process is over now. Admit cards will be available from 20.02.2018 and paper will be held on 4th March 2018. Selection Procedure: Selection of candidates will be done on the basis of final marks obtained in a computer based test (CBT). Essential Qualification: An applicant should have a bachelor’s degree in any discipline along with verbal and written skills in official language of the State/UT for which s/he wants to apply. Application Fees: Rs. 100/- for SC/ST/PWD candidates and Rs. 600/- for others. Important Dates: It is expected that official notification will be out on 10th September 2018. Further dates will be cleared after release of official notification. Selection Procedure: Selection will be done on the basis of final marks obtained after qualifying preliminary examination and main examination. Number of Vacancies: Will be disclosed soon. Essential Qualification: An applicant should have a bachelor’s degree in any discipline along with proficiency in local language. Application Fees: Rs. 100/- for SC/ST/PWD/EXSM candidates and Rs. 600/- for all others. Important Dates: Online application process is closed now. Selection process is going on. Application Fees: ₹100/- for SC/ST/PWD candidates and ₹600/- for others. Important Dates: Online application process is over now. Preliminary examination is going to be held in the last week of March 2018. Further information will be available very shortly. Selection Procedure: Selection of candidates will be done on the basis of final marks obtained after qualifying preliminary and main examinations. Essential Qualification: An applicant should have a bachelor’s degree in any discipline with working knowledge of computer. Important Dates: It is expected that official notification will be out on 22nd June 2018 and examination will be held in the month of August-September 2018. Essential Qualification: An applicant should have a bachelor’s degree in any discipline with at least 50% marks. Application Fees: Rs. 50/- (for SC/ST/PWD/EXS. candidates (Intimation Charges)) and Rs. 450/- for OBC/General candidates (Examination fee+ Intimation Charges). Important Dates: Recruitment event is going on. Selection Procedure: Selection will be done through national level recruitment test in two phases i.e. Preliminary and Main examination followed by a Language Proficiency Test (LPT). Name of the post: Development Assistants/Development Assistants (Hindi). Application Fees: Rs. 50/- for SC/ST/PWD/EXS candidates (intimation charges only)) and Rs. 450/- for all other candidates (Application fee including intimation Charges). No application or intimation charges for staff. Important Dates: Website link for online registration will be activated very shortly after release of official notification. Selection Procedure: Final selection of a candidate will be done through the marks obtained in main examination. From time to time, we will update this piece of writing with upcoming bank exams 2018. If you have any suggestion, feedback or question then feel free to contact us. You can also explore our other informational articles available on this website.